Some relatively big news today for Media Center. Today's session of the Microsoft Professional Developer Conference is all about the new features planned for Windows 7. The attendees have their pre-beta version of the software for testing and feedback now so news and tidbits are leaking out onto the web. Last week many screen-shots were available to look at, but there wasn't much in the way of real news for Windows 7 Media Center. The biggest news out today is that H.264 will be supported on all Windows 7 Media Center products including extenders and Xbox 360. Beyond that, there are plenty of tweaks and UI enhancements and integrating the TV Pack features into the consumer product. My first impression is that additional QAM support (already in TV Pack) and H.264 support are the only non-appearance updates to Media Center. Yes, the user interface is being improved further, but the deep-down below the surface workings aren't changing much from what you see now in TV Pack. H.264 playback (including Media Center Extenders & Xbox 360) - This will be welcomed in a big way by HTPC users. Media Center will finally catch up with SageTV, BeyondTV and GBPVR on this. Shared Libraries built into the "Home Group" features of Windows 7 for music, pictures, videos and recorded TV. Allows you to browse and view content from multiple computers on your home network. Charlie Owen makes this out to be a partial answer to those clamoring for Softsled, but having used BeyondTV Link and SageTV Client (both real softsled products) I'm not sure I understand how this is better for Media Center users. Music "Wall" - you can view all album artwork in the background of your screen while listening to music. Cool, but it doesn't really change the way things work - more of an appearance change. Other Music UI enhancements - read Charlie Owen's blog (link below) for more on this. 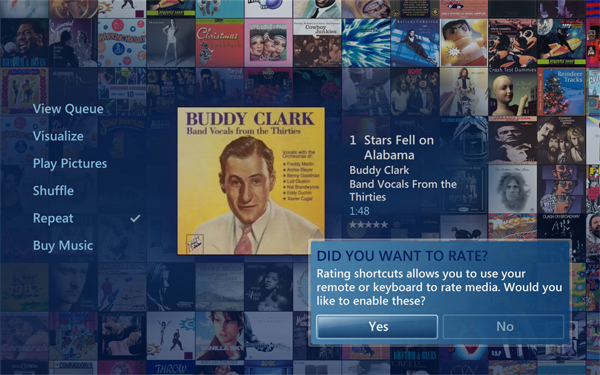 They are minor changes on the surface, but very nice UI enhancements for anyone who uses music on their HTPC. Easier rating of media and the use of those ratings in playlists and slideshows - this may sound like a minor thing, but I see it as a very significant thing for HTPC users. I like the UI enhancements that we're seeing in the new version, but they all seem like things that are smaller, evolutionary changes instead of a major new version of Media Center. I'm left wondering if most of these new features would have been rolled out as part of Fiji (now known as TV Pack) originally to those that already paid for Vista, but when Microsoft shifted gears and decided to abandon Vista and push for Windows 7, they held off and pushed them into that version of windows. I guess in the end it doesn't matter either way except that those that purchased Vista for Media Center are left with very few "upgrades" in between the Windows versions. That being said, if your completely happy with the things Media Center can and can't do and H.264 is the last thing you've been waiting for then your wait is nearly over. I'm guessing we'll see this available late 2009 for purchase.